Mr. Con Haugh, Secretary General of the Department of Arts, Sport and Tourism accepted the formal handover of the Church Records of Baptism, Marriage and Death for the Kerry Diocese from Mr. Bertie Kelliher, Chairman of the Kerry Genealogical Research Centre at Bishop’s House, New Street, Killarney on 27th October 2009 in the presence of Bishop Bill Murphy. The Kerry Genealogical Research Centre oversaw the computerisation of around 500,000 Church records of Baptism, Marriage and Death dating from the 1750’s. Kerry County Council, the Trustees of Muckross House, FÁS and the Catholic Church and Church of Ireland supported this project. The Department of Arts, Sport and Tourism directly supported the computerisation of an additional 100,000 Kerry records. The records which Kerry Genealogical Research Centre transcribed and digitised are among the first to appear on the website www.irishgenealogy.ie .The website is hosted by the Department of Arts, Heritage and the Gaeltacht, previously the Dept. of Arts, Sport and Tourism and it has been redesigned with a web-based search facility for the Church records of Baptism, Marriage and Death under the Church Records Project. The website is an important aid to family history and genealogical research and is an attraction for visitors planning to visit Ireland in search of their roots. The National Archives of Ireland have been very supportive of this project with the experience gained by them in developing the Census 1901/1911. The Census website has been very successful with many millions of people checking their forebears. This new website is an ideal partner to that website. The database now holds the church records of much of Dublin, Carlow, Cork and Kerry Dioceses. Work is ongoing. All records date from prior to 1900 and are based on the original church registers. Some of the earliest records date back to the 1500’s. The Department has worked in co-operation with County Libraries, the board of the former Irish Genealogy Limited (IGL) and local heritage groups in developing the computerised database of Church (Baptism, Marriage and Burial) records available in Ireland. This will facilitate family history research. This work follows on from the work of the Irish Genealogical Project (IGP) which commenced in 1988 as a training and job creation tourism project. Even prior to the commencement of the IGP, the indexing of Parish records was taking place on a widespread basis throughout the country. Since that time the landscape for genealogical research has changed, with its emphasis on access to records via the Internet. The Irish Family History Foundation, (IFHF) is an umbrella organisation of local genealogy centres which were established on the same basis as Kerry. In a manner similar to Kerry the centres digitised many Church records and these have been made available on the IFHF website. I gcónaí riamh bhí spéis ag muintir na hEireann i stair agus i seanchas na ndaoine a chuaigh rompu agus le bunú an tsuímh seo don idirlíon inniu tugann sé caoi dúinn go léir aithne níos leithne a chur orthu siúd dár díobh sinn. Mar is eol dúinn bhí staidéar ar an ngineolaíocht mar cheann de dhamhanna seanscoileanna na mBord tráth dá raibh agus chomh maith leis sin bhí sé mar chaitheamh aimsire cois teallaigh ag gnáthmhuintir na hÉireann. Tá leas á bhaint againn as an teicneolaíocht nua-aimseartha seo chun eolas a fháil ar ár sinsear agus le cabhair an ríomhaire, as seo amach, beidh teacht againn ar ár ngéaga gaoil agus ginealaigh. Tabharfaidh an t-idirlíon spreagadh do dhaoine dul i muinín an ríomhaire agus bualadh lena muintir féin agus a bpréamhacha a aimsiú agus a leanúint. Cothóidh an cuardach seo an mórtas cine agus an fonn athchaidreamh a dhéanamh len ár ngaolta in imigéin. Tá ionad taighde Gineolaíochta Chiarraí faoi chomaoin ag deoise Chiarraí, go háirithe an bheirt easpag, an Dr. Diarmuid Ó Súilleabháin R.I.P., agus a chomharta an Dr. Liam Ó Murchú, a chaomhnaigh an oidhreacht luachmhar atá le fáil sna leabhair chláraithe os na paróistí éagsúla agus a thug gach cabhair agus tacaíocht chun an saibhreas gineolaíochta seo a chur ar fáil don gnáthphobal. Ba mhaith liom, thar ceann an Ionaid seo, ár mbuíochas a chur in iúl dóibh siúd a thug cúnamh dúinn an tionscnamh seo a chur i gcrích: Easpag Chiarraí an Dr. Liam Ó Murchú, An Roinn Ealaíon Spóirt agus Turasóireachta, FÁS, iontaobhaithe Teach Mhucrois, Comhairle Chontae Chiarraí, An Roinn Gnóthaí Sóisialacha agus Teaghlaigh, The Ireland Fund agus na daoine eile a thug airgead dúinn chomh maith. Bhí aidhmeanna uaisle ag na heaspaig nuair a chuireadar síol na hoibre seo fiche bliain ó shoin agus inniu, le hoscailt oifigiúil an tsuímh seo, tá a fómhair á bhaint againn – fómhar flúirseach torthúil. Tá na mílte Cíarraíoch agus Corcaíoch leis (mar tá scar de Chontae Chorcaí i ndeoise Chiarraí) ag tnúth leis an lá nuair a bheidh an seans acu dul ar an indirlíon chun stair na clainne a iomlánú. Tá an lá sin buailte linn. Conscious of the need for those with an interest in their roots to be able to access parish records easily, in November 1992, Dr. Diarmuid Ó Súilleabháin, Bishop of Kerry R.I.P, convened a meeting to initiate the computerisation of Church records of births, marriages and deaths. A limited company was established with Board members drawn from a variety of different backgrounds offering their expertise and experience voluntarily. With the assistance and co-operation of the clergy of the Diocese, the Killarney Genealogical Centre began the mammoth task of taking the original parish registers, some of which dated back to the 1750’s, and transcribing these entries onto cards which were then entered in a computerised database. Bishop Ó Súilleabháin also agreed with Bishop Edward Darling, Church of Ireland Bishop, that the extant historical Church of Ireland records would also be computerised. With the help of a FÁS training project and due to the commitment of its voluntary board, the centre proceeded with its work for several years. However, due to difficulties with funding and despite the valiant attempts of the committee, the centre had to cease its work in early 2000. In 2001, Bishop Bill Murphy, successor of Bishop Ó Súilleabháin, convened a meeting with interested parties to determine if the project could be furthered. This resulted in the formation of a new limited company, Kerry Genealogical Research Centre Ltd., with new members forming the Board of the centre. The new centre began its work in earnest with the support of Irish Genealogy Ltd., the Church of Ireland Diocese of Limerick, Killaloe & Ardfert, the Trustees of Muckross House, Kerry County Council, The Ireland Funds as well as relying on the continuing support of FÁS and the Department of Social and Family Affairs. Premises continued to be supplied by Bishop Murphy and the Diocese of Kerry. Ms. Sinead Creedon was appointed as the coordinator of the project and remained with the project until 2005. In the years between 2001 and 2009, the Kerry Genealogical Research Centre completed the task of compiling a database of over 580,000 records of Births, Marriages and Deaths for the Catholic Diocese of Kerry up to 1900. A further 18,000 Church of Ireland records also form part of the new database. The centre is delighted to have completed this task. Following successful negotiations with the Department of Arts, Sport and Tourism, (and with the provision of the required funding), and with the permission of the respective Dioceses, the Centre has agreed to make the database available to the Department. The Department of Arts, Sport and Tourism will be responsible for making the database available through the world-wide web. The Board of Directors of the Centre, along with the Catholic and Church of Ireland Dioceses, is delighted that this wealth of historical material will now be available, free of charge, to all people of interest, scattered throughout the world. These records are a vital connection with our past. Up until now the records have remained largely inaccessible. Having details of baptism, marriage and death available through this database will enable people to trace their ancestry easily and without cost. With a growing interest in our own country and throughout the world in family history, this database will be of immense value to current and future generations. 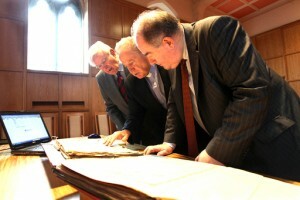 The completion of this project marks a huge step forward in the provision of access to historical records. A task has been completed. A treasure has been unearthed. Let the life stories begin to be traced and told.